If Transformers had been a movie in the 1960s. Back to the Decepticons this issue. Megatron has constructed his “Space Bridge”, which when completed will allow him to established a network with all the planets they’ve conquered. Then the moment he’s really been waiting for begins: Starscream’s uprising. This version of Starscream claims to have looked up to Megatron, but the leader has lost his path, and Starscream wants to get the cause back on track. He’s not alone, as a number of other Decepticons seem to see things from Starscream’s perspective. Megatron finds himself tackling Devastator, but the humans are launching their attack. Meanwhile, on Cybertron, The Autobots prepare their last defense against the Swarm, when Omega Supreme drops in and helps take the rest out. Now the Autobots are on their way to Earth as well. What they got right: Shane McCarthy has finally given me the Starscream I’ve waited years for! Ignoring his namesakes in spin-off shows like the so-called “Unicron Trilogy”, cartoon Starscream has always been a coward who declares himself the new Decepticon leader every time he shoots a spitball at Megatron or the latter sneezes. Marvel Starscream under Budiansky was a sneaky coward, who easily manipulated everyone to gain ultimate power. Under Furman, he had the worst aspects of both versions during the Marvel run, a sadistic psycho during the Dreamwave run (“it’s all about pain” my foot), and fared little better during his previous IDW run. Shane’s Starscream, however, takes the best of Budiansky’s version, and throws in a bit more charisma. He convinces certain Decepticons to start a revolt Toon-Starscream could only dream of, and (if his argument towards Megatron is legit) actually cares about the Decepticon cause, feeling Megatron has lost his way in pursuit of his own power. (Sidebar: I wanted Movie Starscream to give a similar speech to Megatron, who abandoned the Decepticons to gain the All-Spark’s power for himself.) The art between the artists match up better than the other series, but we don’t see any humans this issue, and it’s good art. What they got wrong: The only thing I came up with in the original version of this review was the Combiner situation. Here we have the Constructicons forming Devastator, as we’ve seen in previous issues, but it’s already been established that the technology was unstable, and only used on one group, not the Constructicons. So how can they form up now? Recommendation: The AHM staff are finally beginning to find a balance between story and action. Still needs some tweaking, but when it came out this was still my favorite Transformer story in a long time, given what we had earlier. Now I see more flaws but I still enjoy it. 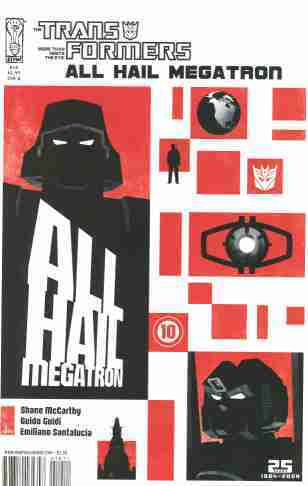 Posted by ShadowWing Tronix on July 5, 2018 in Yesterday's Comics and tagged All Hail Megatron, IDW Publishing, Omega Supreme, Starscream, Transformers.